a book by Tim Darling (email) - March, 2008. 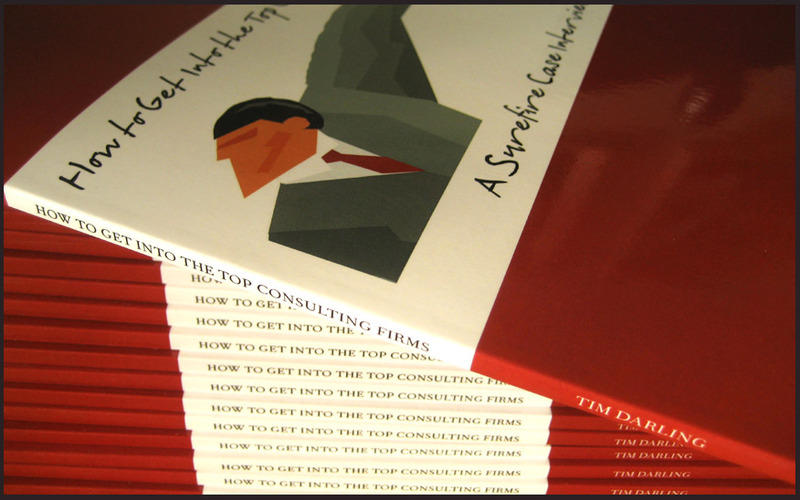 In 2008, I wrote a short book on one way to approach the case interviews that most consulting firms (and many other types of companies) use to screen their applicants. Case interviews are business scenarios where the interviewer sets up a problem such as, “Company ABC is losing profits; how can we find out what the cause is?”. The applicant then has to provide a roadmap or framework to help them walk through all possible causes in an organized way. In this case, investigating changes in revenues and costs would be a good first step in breaking apart the problem into meaningful pieces. 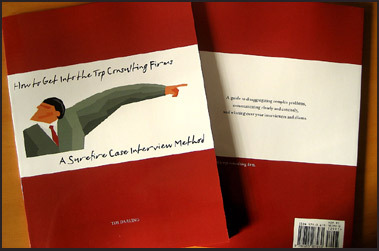 There are a couple of books already available about the case interview process but I found them of limited use when preparing for my interviews. They either give you 20 different frameworks to memorize or they give one “super framework” that appears somewhat forced and unfocused. Further, after spending the summer as at a top consulting firm, I began to better appreciate the science and art of the problem-solving process and the role of the case interview in providing a starting point for a dialogue about it. This book is a reaction to those collections of “canned” frameworks. It is a book about problem-solving and getting to the basic business economics of a problem. The book may not resonate with everyone. It is just one man’s approach. In the book my approach was to step back from trying to provide “perfect” solutions to all possible scenarios an applicant might encounter and instead provide some basic tools and a consistent perspective that will hopefully make the reader more effective on the first day of a consulting study. My belief is that will also have the side-effect of making the reader a more natural interviewee for a consulting position. The book discusses the entire lifecycle including creating a résumé attending networking events, and preparing for behavioral and case interviews. The majority of the book focuses on the case interview process. For the case interview, two main approaches are offered. The first is to provide a method for allowing the interviewee to naturally build a framework on-the-fly for the case given; the second is to provide a single reference point that should apply to many popular case types. In the latter case, the derivation of the framework as well as how to use it is explained in detail. The point of the case interview process is to give the interviewer an insight into how the applicant solves problems. By memorizing dozens of frameworks ahead of time (and perhaps not understanding where those frameworks come from or the extent of what they mean), the applicant often bypasses most of their opportunity to share their real problem-solving skills. This is detrimental to both parties. There has been an unfortunate shift in recent years (in my opinion) to case interviewees wanting to “wow” their interviewer by having all of the answers ready as soon as the case problem has been announced. Their focus is thus on memorizing generic problem solutions and appearing as polished as possible. Maybe this impresses some interviewers, but I take a different stance. The problem-solving process should be worked through for every unique situation; alas, the process is sometimes messy and requires you to roll up your sleeves and use your intelligence and creativity. Perhaps some interviewers disagree with this. As I said, this is just one man’s approach. My hope is that this book will be one voice helping to open up the natural flow of conversation between interviewee and interviewer again; if that happens, I believe that both the consulting firms and their applicants can only benefit. The Second Edition is available on Amazon.com. Read an article. All text and pictures copyright © 2008 Tim Darling.